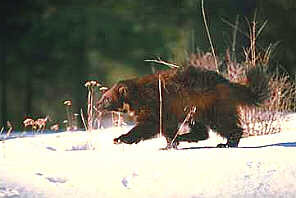 Description - A bulky, bear-like animal, the wolverine is dark brown with broad, yellowish bands from shoulders to hips, meeting at the base of the tail. The male is generally larger than the female and average weight is 18-42 pounds. Distribution - Preferring forests and tundra, the wolverine is distributed throughout British Columbia except in heavily populated areas. The also occupy Alaska, Yukon, and the Northwest Territories but are rare in the Prairies and eastward. Biology - 2 to 5 wolverine young are born in the early spring in a protected area such as a thicket or rock crevice. They remain with their mother for 2 years. The wolverine eats anything it can find or kill; being poor hunters they tend to follow wolves and bears, feeding off the leftovers from kills. In general, the most severe winters when ungulates fare poorly are the winters when wolverine thrive. Because the oils in the wolverines fur make it frost resistant, man uses it abundantly to line or trim parka hoods. The main cause of mortality in wolverines is trapping by man.